Pertamina Energy Tower to generate all its energy — really? 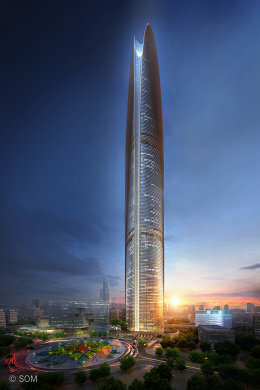 Fast Company has a short article by Adele Peters that describes some design features for the 99-story Pertamina Energy Tower that is planned for construction in Jakarta. The building, designed by Skidmore, Owings & Merrill, will be the “first supertall tower in the world to generate its own power” apparently by capturing wind power at the top of the building and sucking geothermal from the bottom. Excuse me if I am a bit skeptical. Flash back 15 years to a different architect — William McDonough — whose firm designed the Oberlin College’s Adam Joseph Lewis Center. Bill is the standard bearer for architects that make fantastic claims backed up by little substance [Green guru gone wrong – Fast Company]. This success requires a media willing to publish such claims years before we ever see the fruit of the work. When the fruit finally arrives — shriveled and disappointing — it matters little because the architect has moved on. Consider Oberlin College’s Adam Joseph Lewis Environmental Center. Long before its construction in 2000 McDonough was claiming he had designed a zero energy building — one that would be powered by solar cells mounted on its roof. Through the years his claims never wavered. Never mind that, following construction, the building consumed three times the energy his firm claimed it would [Early performance of a green academic building – ASHRAE] or that years later, after hundreds of thousands of dollars of HVAC modifications, it consumed double his initial projections — less than half the energy provided by its rooftop array. Now, after 12 years of false claims the building has finally moved “into the black” powered by a $1,000,000 PV array constructed over a nearby parking lot which, combined with its $400,000 rooftop array, produces 3X as much energy as the the design team projected for the building. [A paler shade of green – HPAC Mag] I wonder how much attention McDonough would have gotten in 1998 had he told the world that he had designed, at a cost of $500/sf, a 14,000 sf building that used 20% less energy than conventional buildings and was to be powered by PV panels covering its roof and a parking lot, costing $1,400,000. (That is an additional $100/sf just for the solar arrays.) Excuse me Mr. McDonough — what was your “value added” — publicity? But this post is about another project — the Pertamina Energy Tower. My point is this. Talk is cheap. There is little doubt that this building will not deliver on its promises. But for now the architects can spin their exciting story to media who don’t ask the hard questions — like “wouldn’t a shorter, fatter building be cheaper and use less energy? Or, “how much rental space is lost to provide space for the wind turbines and what is the cost/benefit of this?” Physicists are good at “back of the envelope” calculations. A 99-story building seems like an expensive way to mount a wind turbine. This entry was posted in Adam Joseph Lewis Center, building energy, pragmatic choices, William McDonough and tagged William McDonough by The Pragmatic Steward. Bookmark the permalink. As the old saying goes, “Let the buyer beware”. Thanks for your post on this “design.” You continue to address important and fundamental issues regarding “promises and performance.” This is a good example. Apparently, this design is not “finalized”: Adele Peters cites Scott Duncan (SOM Project Director) as stating that all of the building’s energy needs will be met if and when the geothermal design is completed and accepted. The claims (i.e., “promises”) made in the SOM link are less grand, but none-the-less questionable: 1) 25% of the energy needs will be provided by renewable resources (but the expected EUI is not given); so what does this claim mean with regard to performance? 2) a 26% reduction in CO2 emissions is claimed; but reduced from what base? 3) a reduced water demand with a target of “zero discharge” but with what impact on hygiene and health? Moreover, the economic impact of this design is not addressed. What are the expected first, operating, maintenance, and life-cycle costs? Who will have the knowledge and training to successfully operate and maintain this facility? What is the net present value or the expected rate of return on the investment of the building to be built in accordance with this design? Until we know the whole story, the claims that are made without accountability will continue to cause a lack of credibility in the designs that are intended to meet real (i.e., measurable) sustainability goals, as you have pointed out in the Oberlin College’s Adam Joseph Lewis Environmental Center experience. It turns out this is not the first tall building to integrate wind power. The Bahrain World Trade Center powered up its wind turbines in 2009 to great fanfare — but you won’t find much about them on the web in recent years. Rumor is they have been shut down indefinitely. An article in the Environmental Building News entitled “The folly of building-integrated wind” says “building integrated wind doesn’t make much sense as a renewable-energy strategy.” The article specifically mentions the Bahrain building. It also goes on to say that despite the growing number of building-integrated wind installations it is nearly impossible to obtain actual performance data for them — with the obvious implication that actual performance is much worse than advertised. Much of architectural activity is a version of the “Music Man” story as you so persuasively outline regarding McDonough. The idea is to promise the moon, get the job, and be gone, or just as adequate an outcome, leave the owner so embarrassed at being hoodwinked that they too spend a great deal of time putting lipstick on a pig (or in your case paying for a lot of useless solar panels). But architecture and architects have a long history or this. In the past it was things like, “if you design it this way, I can reduce urban poverty,” or “if we do it this way it will make people more spiritual,” or “it will create a sense of ‘community’,” etc. etc. They are used to making assertions which are statements of good intentions not to be taken seriously. Unfortunately, the world of green architecture is infected with this rhetoric of good intentions without substance. As Jim Woods points out, accountability seems lacking from the discussion by both reporter and subject. But of course, years ago, when SOM was convinced of the truth of another stylistic solution to all architectural problems, they were commonly referred to as “three blind Mies”. Take a look at the Bahrain World Trade Center Building (http://en.wikipedia.org/wiki/Bahrain_World_Trade_Center) that had three wind turbines put in with a whole lot of hoopla and have been permanently stopped for a very long time now. They are only very expensive sculpture now. The Masdar Project in Abu Dhabi is another great example of a completely failed “green project” completely surrounded by marketing and media hype. Once it becomes clear that many engineering firms are also part of this scamming (after all they get paid by the architect to spend a lot of money claiming this stuff will work or spending other people’s money to try and get it to work) one understands why so many respected engineering design professionals are promulgating this kind of silliness. After all, if you want me to engineer an ion propulsion system that currently doesn’t exist or can’t possibly make sense to put on the back of your pick-up, we’d still be happy to help you for a gazillion dollars (can anyone say Net-Zero Energy buildings). The most interesting thing is that the technique you rightly discuss here regarding McDonough is the model of success in the field of architectural business development. One of the most stunning attributes of a successful architect of the McDonough-type is that contradictory facts have no impact on his views since they are only assertions of will. Duncan may not share the architect with cape ethos of McDonough, but he is after all being guided by a very powerful in-house marketing machine at SOM whose sole purpose is to create “buzz,” and support the business development task not to worry about accountability. This is simply the expected puffery of the salesman they would argue. But of course, one doesn’t expect licensed professionals to act as salesman/brokers in most cases. One for example, doesn’t go to the doctor thinking his claims about the performance outcome of the surgery are the expected “puffery” of a salesman. Super-tall buildings are the perfect fodder for SOM since the buildings don’t have to make any economic sense at all. These are exclusively vanity buildings and are backed by sovereign funding or other non-economic performance funding which also takes place in the private sector, to wit, the vainglorious CEO. SOM has always sought to be the architect du roi and has a great or dismal, depending on your view, record in doing work for questionable potentates and regimes around the world. But I don’t mean to single out SOM or to suggest I have some moral problem with them working for questionable potentates or regimes. Every architect and architectural firm hopes to reach this pinnacle of achievement. Architects do not compete on competence, performance of their buildings, cost reliability, or risk management for the client. The reasons for this are complex and involve not only the odd sociology of the architectural profession (though it is far from clear if most architects have a coherent notion of the duties of a profession), but most importantly, a problem known as asset specificity in transaction cost economics. Many of the problems in dealing with high-performance buildings are linked to this problem. If the aspiration to performance is all that is necessary, then it follows that little time or energy should be spent measuring or determining objectively if the performance has been delivered. One final thing. The scam artist is most successful when he presents something that the mark wants to believe and we must look closely at the nature of both sides of these relationships. When you hire, Gehry, or Hadid, or Morphosis, or SOM, you really don’t care about the performance of the building in reality as much as the cultural and media frisson that reflects on you and yours. The problem for those who are actually concerned with building performance is that these projects and the claims and misrepresentations so commonly trotted out about them confuse, confound, and permanently stymie attempts to move architecture from psychobabble to science. Maybe architects (and the engineers who serve them) are not yet ready to give up on the magical thinking that animates their profession. Thanks for insisting that a robust sense of science should play a much larger part in thinking about building performance in all its forms.